"Building Cyber Security and Data Management Awareness"
The increasing volume and sophistication of cyber security threats including targeting phishing scams, data theft, and other online vulnerabilities, demand that we remain vigilant about securing our organization. The current cyber security risks that are top-of-mind, the risks that aren’t, and the ecosystem that’s coalescing to form defensive—and offensive—measures through new strategies and tactics in data and infrastructure security. 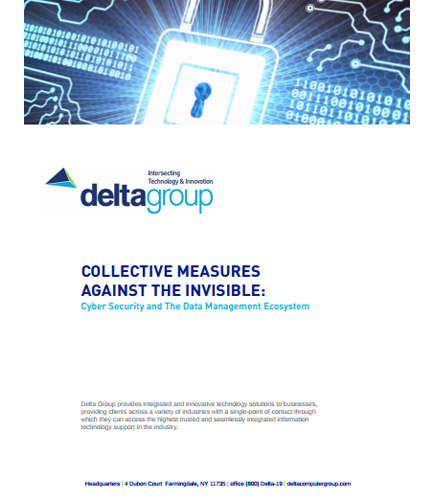 This whitepaper explores the idea of a healthy, resilient – and fundamentally more secure – cyber ecosystem of the future, in which cyber participants are able to work together in near‐real time to anticipate and prevent cyber attacks. Protect your systems from cyber security threats, while keeping costs down, heads clear, and minds at ease in the ecosystem. The legal and social effects of digital identity have become complex and challenging with attacks on multiple identity services. At a time when our dependence on digital identities is increasing, our trust in them is rapidly eroding. A Trusted Digital Identity is an identity that is real, that doesn’t have a history of fraud or potential money laundering, and that isn’t associated with nefarious organizations. There is clear value in performing identity validation beyond compliance. The more certain you are about dealing with a real identity, the better you understand the risk involved in a transaction. Read this whitepaper to discover the challenges, opportunities and possible applications in the field of digital identity and security. It addresses the following key questions: How to create unique digital identities based on an individual’s online attributes and behaviors? How to aggregate an individual’s online financial/payment behavior in order to predict the risk of doing business with that individual? What are the set of principles and standards for the use of accredited government and third-party digital identities to enable individuals and businesses to access services easier? What is the right tool for uncovering and stopping the complex digital identity theft?